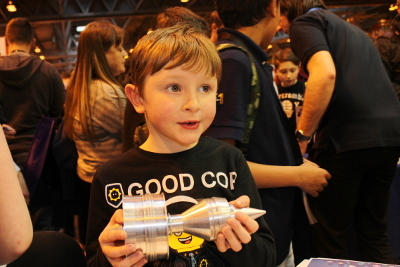 The Big Bang fair is a free STEM (Science, Technology, Engineering and Maths) event aimed at children aged from 7 to 19. It's an annual event and I first attended the Big Bang Science Fair last year - Big Bang Fair 2014. I took my 8 year old daughter (now 9 year old) along and she really enjoyed the event. After last years experience we signed up again as soon as registration was open, but this time I took my son along now aged 7 and my daughter brought along two school friends as well. My wife also joined us. My own children are very interested in technology and science, but this is an event that makes the subjects fun for everyone. Even my wife had to admit that she enjoyed the day out and she is not normally interested by science and technology. 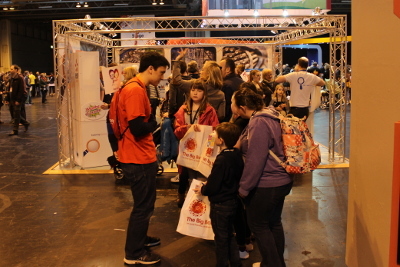 The event is held at the NEC. There was a change in the halls used from last year with the layout being arranged a little differently (and longer walk from the train station), but otherwise it followed a similar format. We started in the power and energy area, with lots of activities relating to energy generation and supply. 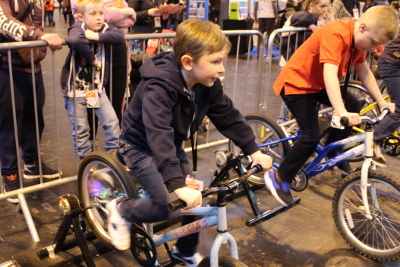 The first activity we joined in with was generating electricity using pedal power. A way of illustrating how much energy is needed for common household electrical items. One of the things I wanted to take my children along to was the Astro Pi stand featuring Dave and Clive from the Raspberry Pi foundation. They have teamed up with the European Space Agency and astronaut Tim Peake to take some Raspberry Pi computers up to the International Space Station (ISS) and run some children's code. We talked with Dave who showed what the Astro Pi Hat looked like and gave a run down of it's features. The children are now thinking up ideas for what programs could be useful for the ISS. 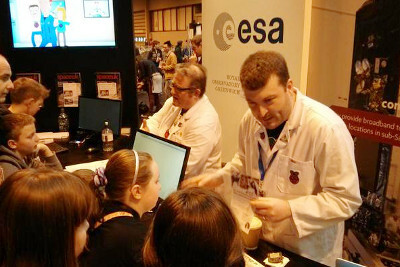 As well as lots of hands-on things to do there was lots of information on careers in STEM subjects, useful for older children, but also a great way to get the younger children thinking about a future career in STEM. 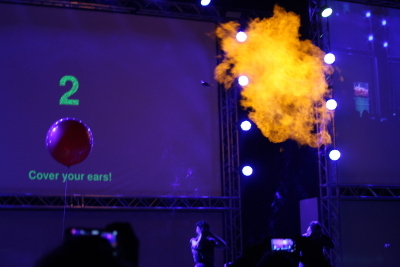 Our main highlight of the Big Bang Fair was a show on the main stage. Last year we saw Kaboom! an explosive history lesson about explosives. 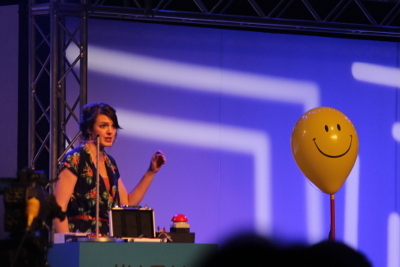 This year we watched #Error404 - a introduction to computer programming by Fran Scott. The show was amazing! It included many examples of the Raspberry Pi in action and the inner workings of computers using humour, audience participation and of course Big Bangs! The show was really good fun which kept the children entertained as well as teaching them about computing. It would take too long to list all the things we saw and activities we did but it included - a full size K'Nex model of Bloodhound SSC (designed to be the worlds fastest car), generating electricity with a Cummins generator, controlling Vex robots, crash testing a model train and assembling a model of a Rolls-Royce jet engine. 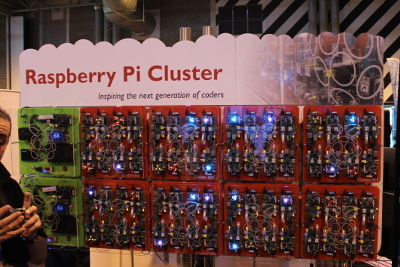 One of the last things we saw was the world's largest Raspberry Pi cluster (Bramble) which was on show with GCHQ. They also had some fun interactive games. Suffice to say we had a great time at the event. The only thing was that there was far too much to do with only so much time to do it in and so much that our legs could take (especially as the kids had been on two different bikes generating electricity to boil a kettle and light a light-bulb). It was a case of picking out of a few activities and trying to fit in as much as time allowed.